We come now to the heart of the book, some of the most beautiful and meaningful writing I know. After the king and the duke lose all their money trying to rob Mary Jane and her family, the king sells Jim back into slavery for forty dollars. It’s a sharp slap in the face to readers who may have gotten caught up in the adventure and forgotten (as apparently Huck has forgotten) that Jim is in peril every moment he spends in the South. Now reality sinks in, and Huck is faced with the decision he’s been putting off ever since the pair missed Cairo in the fog. Huck knows now that the game is up. Jim has been captured. He’ll either end up with a new master, or else go back to Miss Watson, a woman who even before Jim ran away wanted to sell him to a plantation in New Orleans. The words are too beautiful to paraphrase; I’ll just quote them. It’s way too much for a blog entry, I know, but you need the entire passage to truly understand. As modern readers, it’s hard to put ourselves in Huck’s place. We know slavery is a great evil; we know Jim is not property; we know Huck is doing the right thing by helping Jim escape. But Huck doesn’t know any of this. Every single influence in his life insists with a certainty that cannot be questioned that slavery is natural and right, that Jim belongs to Miss Watson, that helping a slave escape is not just wrong but a deep and mortal sin. Huck would be not just despised by his neighbors but condemned to hell. Huck doesn’t just feel guilty. He is also scared! He is convinced that not just human but divine retribution awaits if he doesn’t turn Jim in. But something isn’t right. How can it be that Jim cares for his family? How can it be that Jim cares so deeply about Huck? 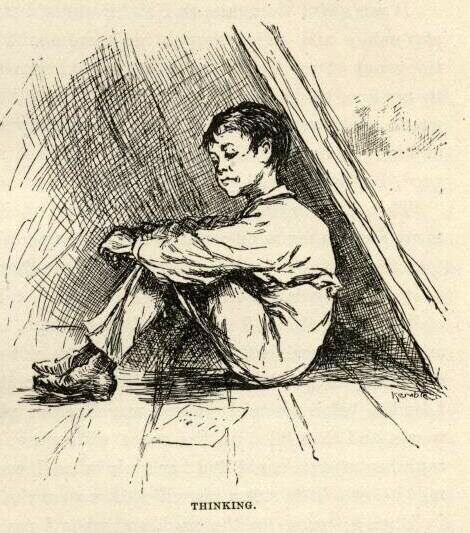 How can it be that Jim is a man, far more of a father to Huck than his own father ever was? Back in education school we called such events examples of “cognitive dissonance.” Our brains want to make sense of the world, and Huck has come to a realization. A world in which a human being such as Jim can be property just doesn’t make sense. Huck can’t assimilate this realization about Jim into his model of the world. Instead, Huck must remake his model. Even though it means punishment, and shame, and guilt, and hell, Huck can’t turn Jim in. He has to follow his heart.